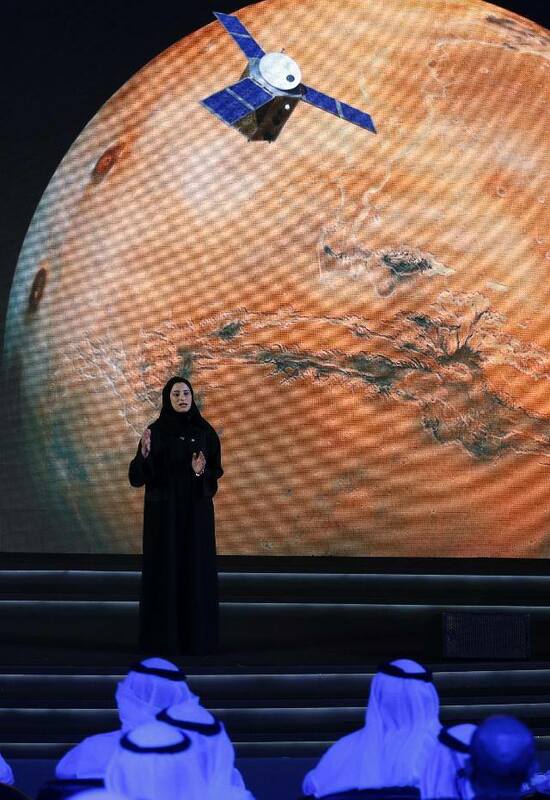 Sarah Amiri, deputy project manager of the United Arab Emirates (UAE) Mars Mission, speaks during a ceremony to unveil the mission on May 6, 2015 in Dubai. The Hope mission aims to provide a global picture of the Martian atmosphere. On May 7th, 2015 the University of Colorado announced a partnership agreement with the United Arab Emirates on a 2021 Mars Mission. The complete announcement, including The UAE’s U.S. scientific-academic partners also include the University of California, Berkeley, and Arizona State University, here. In an interview with Forbes, ‪#‎MAVEN‬ principal investigator and Hope mission co-investigator, Bruce Jakosky, offered some insight into how the two missions will complement each other. The complete article in Forbes is here.